The New York auction house of Christie’s will be offering 19 horse-themed paintings from well-known American equestrian artist Richard Stone Reeves at a sale next month. The paintings will be offered at the firm’s Interiors auction, which runs from June 23-24. Reeves was born in New York City in 1919 and was raised in Garden City, Long Island. He built a reputation as one of the finest American equine artists of the 20th century. 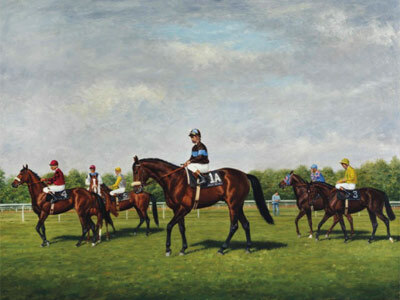 Reeves, who died in 2005, painted more than 1000 racehorses throughout his career, which began just after World War 2. He was keenly sought after for these commissions and his roster of subjects included some of the greatest horses to have raced, including winners of the Kentucky Derby, Preakness Stakes, Belmont Stakes and even Triple Crown winners. His neo-Romantic portraits are valued by horsemen and laymen alike. The works are being offered from his estate’s private collection. The paintings carry pre-auction estimates that range up to $US25,000. The offered works include Tom Fool at Morning Workout, Belmont; Black Gold, Northern Dancer; Hill Gail with Eddie Arcaro Up; Shut Out; Go For Gin; Bayakoa; and Willie Shoemaker in the Colors of Lazy. The paintings can be viewed here.